One of the cause of skin aging is a damage to the collagen and elastic fibers and disappearance of hyaluronic acid in tissues. As a result of the destruction of the base created by the collagen and elastin, skin becomes looser and saggy. Your face starts to look sad and gloomy and your cheeks and lip corners are drooping. Lines around the mouth, nose and wrinkles on your neck become deeper. To prevent these changes you can undergo a treatment called First Lift. The safest product for performing such procedure are lifting threads PDO. The PDO thread has no cones or hooks that lifts the tissue. Lifting effect is achieved thanks to a special braid of threads and properties, that stimulate the synthesis of collagen and elastin, thanks to polydioxanone - the substance of which lifting threads are made. PDO (polydioxanone) is a material known and used in medicine for many years in the seams of the skin and subcutaneous in plastic surgery, gastroenterology, urology, gynecology and ophthalmology. 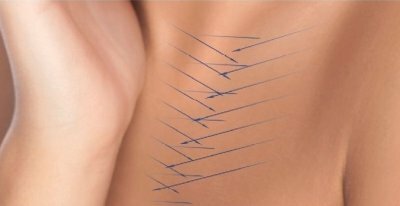 When it was noticed that the presence of the PDO thread in the tissue strengthens the muscles and tendons of the body, the method has been applied also in aesthetic medicine. Currently, the PDO method is used in Japan, USA, Brazil, Russia and Western Europe. This product has a CE safety certificate and can be used all throughout the European Union. PDO lifting threads are placed in a sterile, very thin needle, with which we inject them in a certain area of ​​the skin of the face, neck and body. 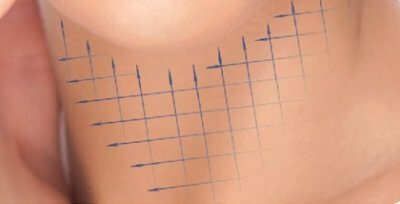 By injecting PDO thread into the skin we influence on strengthening flabby tissues to obtain an immediate improvement in its appearance. 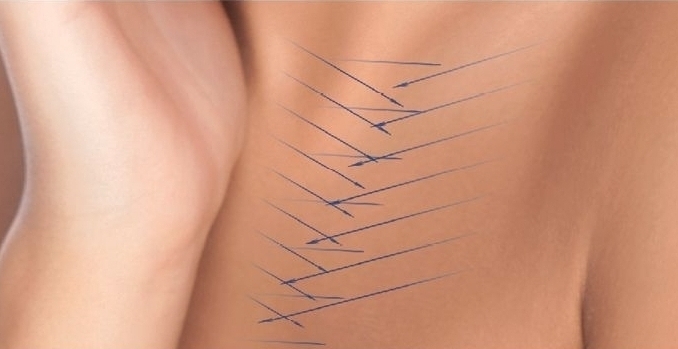 The technique of injecting PDO threads is based on the use of natural skin tension lines, which also causes an effect similar to a surgical facelift. Based on clinical observations, it was found that the PDO thread lifting stimulates neocolagenesis process in the tissues - the production of new collagen is responsible for tightness and firmness. In addition, stimulation of fibroblasts results in stimulating the synthesis of elastin, responsible for firmness and elasticity. These processes start after approximately 10-14 days after treatment and last throughout the whole period of the thread being in the body (up to 7-8 months). In vivo studies also found that the effect of PDO causes synthesis of the natural (endogenous) hyaluronic acid. Thanks to this mechanism, our skin, where we inject the PDO thread becomes firmer, more supple and moisturized. With PDO threads we can also reduce the strength of mimic muscles of the face and get aesthetic effects similar to the botulinum toxin - relaxation of muscles and smoothing facial features. The aesthetic effect is more natural than injections of botulinum toxin, because we do not stop mimic muscles, but we are only making them relaxed. First Lift PDO is dedicated for patients of the age of 30-55. The effects consist of skin rejuvenation, skin smoothing and brightening, wrinkles reduction, shrinking the pores, increase or decrease of the face volume and overall face lift. One of the most important advantages of PDO thread lift is the fact that you can use it not only on the face but practically all over the body, even to improve the structure of the skin on elbows, knees, abdomen, buttocks, neck or chest. obesity - arms, abdomen, ribs. With First Lift treatment you achieve an excellent, natural looking results of rejuvenation without surgery. Improvement in the skin is visible immediately after the treatment, and the optimal effect is fully noticeable after 2-3 weeks. The result lasts approximately two years, depending on the individual patient's predisposition. The healing period lasts 1-2 weeks but after a few days you can go back to everyday life. Due to the rapid rate of thread absorption, there is no risk of scarring and thickening. Lifting the eyebrows will greatly emphasize the eye area. Your skin will become luster and its quality will be vastly improved. Horizontal wrinkles reduction associated with facial expressions. This treatment will effectively lift, smooth out and firm your skin. Wrinkles removal around the temples area, plumping the skin. Wrinkles removal around the eye and temples area, skin plumping. This treatment will remove shadows and puffiness under the eyes, as well as small lines around the eye area. Narrowing the wings and lifting the tip of the nose will optically slim your face features. Using the thread we can also correct the shape of the nose. Drooping lip corners give the appearance of sad and tired looking face. PDO THREADS give the effect of mild lip corners lift and radiant looking face. Vertical wrinkles above the upper lip can be firmed with PDO THREADS. After the treatment you can see improvement of skin quality in this area. Applying PDO THREADS into the jaw area will lift and firm your skin, which will emphasize the jaw line. In addition, it will lift the marionettes wrinkles and lip corners. Wrinkles and drooping cheeks can be effectively lift with PDO THREADS. Your skin will become firm and radiant. A lot of women struggles with double chin. Because of that, sometimes we can lose our delicate face features. Applying PDO THREADS into the chin will remove unwanted, double chin, emphasize the jaw line and improve skin firmness. Applying PDO THREADS to the neck will help removing the horizontal wrinkles around the neck area. After the treatment we can see the improvement of skin condition and its revitalization. PDO THREADS treatment give the revitalizing effect to the skin, as well as its smoothing and firming. It can also remove small wrinkles around décolletage area. Applying a couple of threads around the elbow area will help firm and lift sagging skin. By applying the threads we can lift loose and sagging folds under the arms. This procedure provides us with a profound revitalization of the skin. Firm breast is something every woman dreams about. Applying the treads into the chest area will firm and slightly lift your breast. Using threads will help reducing the amount of stretch marks, as well as firming sagging skin. In addition, we can reduce the fatty tissue in specific area of your stomach. Applying PDO THREADS into the tights area will improve firmness of your skin as well as reduce the cellulite. Improvement of firmness, sagging skin lifting, cellulite and stretch marks removal. All of us dream about cellulite-free skin and with PDO THERADS you can say goodbye to cellulite forever! This treatment will make your skin more supple, firm and smoother. Applying PDO THREADS above your knees will smooth and lift your skin. Skin folds will be visible lifted, which will make your knees look much more slim. PDO THREADS can also be used in alopecia treatments. After its application, the blood circulation and activation of hair follicles are improved, resulting in growth of new hair.